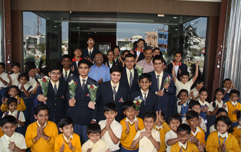 Promotion is granted on the basis of performance of the pupil throughout the year. Hence regularity in attendance and work is imperative. Results declared at the end of the session are final in all cases and will not be reconsidered. If a child is absent in any of the tests/exam. No provision for retest.